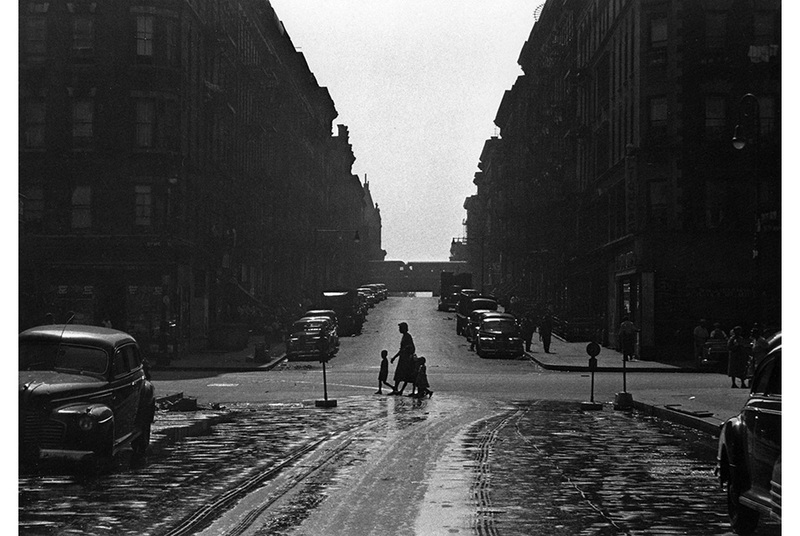 Roy DeCarava, Woman and Children at Intersection, 1952. ©Roy DeCarava. Courtesy the artist and the gallery. MIAMI FLA.- Following its successful debut last year, Survey will return with 14 exhibitions of work made before 2000 brought by leading galleries from Brazil, China, Germany, Italy, Japan, Spain, Switzerland, the United Kingdom and the United States. The sector will include works by Charles Burchfield, Peter Campus, Gianni Colombo, Roy DeCarava, Rosalyn Drexler, Dorothy Iannone, Wang Jinsong, Heinz Mack, Roberto Burle Marx, Shinjiro Okamoto, Miguel Ángel Rojas, Peter Saul, Keith Sonnier and Ettore Spalletti. The 14th edition of Art Basel's Miami Beach show, whose Lead Partner is UBS, will take place at the Miami Beach Convention Center from December 3 to December 6, 2015. Nine of the 14 international galleries in Survey this year will be entirely new to the show. Castelli Gallery will mark its debut at Art Basel in Miami Beach with a selection of iconic sculptural works by the Post-Minimal American artist Keith Sonnier (b. 1941, United States). When his pieces were initially exhibited by Castelli Gallery in the 1960s, Sonnier set a precedent for abandoning the rules of traditional sculpture, forgoing the pedestal to create wall-based works and trading traditional media such as bronze and marble for unconventional and psychologically loaded materials, such as cloth and latex. For Survey the gallery will select works from the 1960s that employ materials with a skin-like quality, which Sonnier accentuated by allowing them to retain organic shapes and movement. With over 500 pieces of conceptual photographs, videos, installations and documented performances, first-time exhibitor Beijing Art Now Gallery will provide a concise exploration of the development of pioneering artist Wang Jinsong (b. 1963, China). Indicative of the early experimental work that emerged in China in the 1990s, the booth will feature Wangs iconic work Standard Family (1996). Vistamare, also new to the show, will feature a selection of abstract paintings and minimalist works by Ettore Spalletti (b. 1940, Italy) created between 1992 and 1999. Suspended between painting and sculpture, Spallettis works are known for their focus on light and space, chromatic backgrounds, use of essential geometric forms and laborious layering of plaster and pigments. Miami Beach newcomer Beck & Eggeling will present work by the acclaimed ZERO artist Heinz Mack (b. 1931, Germany). Co-founded by Mack together with the artists Otto Piene and Günther Uecker, ZERO was one of the most important German post warmovements. Bergamin & Gomide will return to Survey with the first US exhibition of acclaimed landscape designer Roberto Burle Marx (b. 1909, Brazil) that focuses on his work as an artist. Through a focused collection of important paintings, drawings, landscape projects and jewelry, the gallery will expand the viewers understanding of this acclaimed Brazilian figure. Shinjiro Okamoto (b. 1933, Japan), one of the forerunners of Pop Art in Japan, will be showcased by first-time Miami Beach participant Tokyo Gallery + BTAP. Okamotos sharp responses to the shifting ideologies from prewar imperialism to postwar democracy are concealed within a lively humor, playfulness and complex irony. In a series of cartoonish panorama paintings from the 1980s and 1990s, Okamoto reimagines the brutal scenery of the atomic bomb and the devastating air raids over Tokyo. Vintage gelatin silver prints by Roy DeCarava (b. 1919, United States), an AfricanAmerican photographer who was an integral figure within 20th-century American art, will be the focus at Jenkins Johnson Gallery, exhibiting with Art Basel for the first time. Representing the largest body of DeCaravas photographs on view in nearly 10 years, the exhibition will include portraits of jazz legends, scenes of everyday life in New York from the 1940s to1970s, and rare work from the award-winning book he co-authored with the poet Langston Hughes, The Sweet Fly Paper of Life (1955). Also new to the show, Cristin Tierney Gallery will present groundbreaking single-channel videos by Peter Campus (b. 1937, United States), forming a discrete group of nine artworks that will be seen together for the first time in over 30 years. Created in the early 1970s, Campus videos pushed the boundaries of this new medium and have influenced generations of artists since. Exemplifying avant-garde artistic practices of the era, his works reflect his interest in cognitive psychology, identity construction and existential questions of human existence. A series of evocative and often sexual large-scale paintings on canvas, drawings and prints by Dorothy Iannone (b. 1933, United States) will be on view at Peres Projects. Representing important stages of her practice from the 1960s through the 1980s, the featured pieces have been the focus of museum exhibitions, including most recently a solo show at Zurich's Migros Museum and a retrospective at the Berlinische Galerie. First-time exhibitor Robilant + Voenas presentation of Gianni Colombo (b. 1937, Italy) will include drawings executed for Colombos immersive gridded environment Spazio elastico (1967), as well as subsequent mixed media and motorized pieces exemplifying his investigation of the potentialities of altered, moving and flexible space. A significant piece of postwar Italian art, Spazio elastico (1967) was first installed at Neue Galerie am Landesmuseum Joanneum, Graz in 1967 and was later exhibited at the 1968 Venice Biennale. Another highlight of this years Survey will be the large-scale works by Rosalyn Drexler (b. 1926, United States) at Garth Greenan Gallery. Seven of Drexlers most iconic paintings from 1960 to 1965 will be on view, charting the development of her unique brand of hand-painted Pop art, as well as her career-long fascination with images of violence. George Adams Gallery will feature the early stages of Peter Saul's (b. 1934, United States) career with an exhibition of paintings and works on paper from 1959 to 1976, marking the gallery's debut showing with Art Basel in Miami Beach. Works will include never-before-exhibited early paintings and pastels based on imagined landscapes, portraits and interiors, as well as a notable two-sided canvas demonstrative of Sauls emerging response to Pop Art. Later works will include examples of his controversial and provocative depictions of women and reflections on contemporary American society. Miguel Ángel Rojas (b. 1946, Colombia), a conceptual and multimedia artist known for works addressing marginality, identity and the political reality of his native Colombia, will be on view at espaivisor. Rojas practice has ranged from personal explorations of the subjective experience, such as photographs secretly capturing public encounters between gay men in 1970s Bogotá, to indictments of drug trafficking and consumption through the reconstruction of pop imagery from coca leaves. espaivisors installation will largely focus on Rojas early works, including delicate pencil drawings from the 1970s and the haunting photographs of his Serie Faenza from the 1980s. DC Moore Gallery, returning to Art Basel in Miami Beach following a brief hiatus, will feature a focused exhibition of exceptional watercolors from the extensive career of Charles Burchfield (b. 1893, United States). One of the most innovative artists of the 20th century, Burchfields intensely personal, spiritualized view of the world is evident in his visionary landscapes that address the harsh realities of 20th-century industrialization and daily life in small towns and urban areas.